International Art Exchange, Inc. celebrates street art and Richard Hambleton. Seventy-two thousand, five hundred attendees swarm to Wynwood, Miami’s buzzing art district, and await the premier with baited breath. Art Wynwood, Miami’s second most prestigious contemporary art fair, has staked its claim in the annual calendar of must-attend events. The 2016 edition, expecting 70 international galleries, is shaping up to be no exception. Ranging from the highly anticipated "Irreconcilable Images" photo exhibit by Shark Tank’s Kevin O’Leary, to cutting edge murals by emerging street artists, Art Wynwood has solidified its undisputed claim to being this season’s premier art fair. Add to that the impressive list of guest celebrities, and a charity aspect – all proceeds benefit the Perry J. Cohen Foundation, providing education scholarships to Marine Science or Wildlife students – and Art Wynwood has effectively changed the game. Wynwood’s street art is even boasted to be art history in the making. The International Art Exchange, Inc. is an internationally focused gallery, dedicated to becoming the center point of an extensive and intricate network of artists, galleries, and consumers. Our firm offers a genuinely unique range of works of fine contemporary art. This year, we are pleased to announce an exclusive exhibition of street artist, Richard Hambleton’s momentous art work, both in our showroom, at 11900 Biscayne Boulevard, Suite 110A, Miami FL 33181, and on our website. 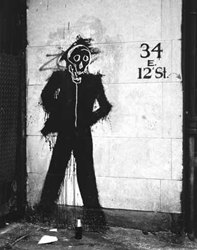 Nicknamed the “Godfather of Street Art,” New York’s Richard Hambleton is one of the leading artists of this century. His resume spans over three decades, and features both street and studio art. His trademark "Shadowman" series (pictured above), and "Marlboro Man" painting are instantly recognizable. Hambleton and his collaborators, Keith Harring and Jean Michele Basquiat (recently featured on the cover of Vanity Fair magazine), are credited as being the creators of the street art movement of the 80s. Equally prominent was Hambleton’s public art project of the 80s, titled "Image Mass Murder," within which he staged fictional and graphic murder scenes in New York city using chalk outlines. His work has been featured in museums and galleries across the globe, including Brooklyn’s PS1; the New Museum; Kunsthalle Wien; and now, Miami’s very own International Art Exchange. Hambleton has also been the recipient of the prestigious 2015 Woodward Gallery Director’s Choice Awards.